Seventeen-year-old Jonah Daniels has lived in Verona Cove, California, his whole life and only one thing has changed: his father used to be alive, and now he's not. Reeling from the tragedy, Jonah must take care of his family. Vivi is in love with life. A gorgeous, unfiltered hurricane of thoughts and feelings, she transforms Jonah's family and changes his life. 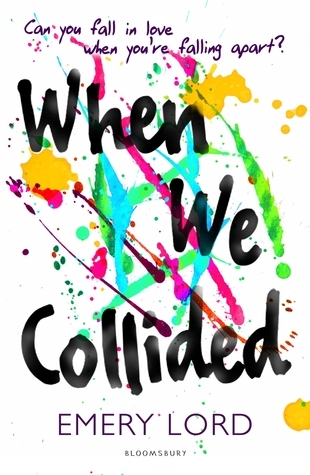 In the months before I finally caved in and bought myself a copy of When We Collided by Emery Lord, I saw SO many positive reviews for it. I knew it would be good. After all, loads of bloggers I love had said it was amazing, so it had to be, right? But I didn't know it would be that good, the kind of good that can end a few bad weeks and make me think, y'know, maybe things will get better after all. And it takes a rare, special kind of book to do that. You might be thinking something along the lines of: Amber, no offence, but this sounds pretty cliche, are you sure this is actually, like, good? I see where you're coming from. The reason it took me so long to buy a copy is because, despite all of those glowing reviews, it seemed like yet another one of those books where the protagonist is mentally ill but then along comes a Love Interest and they're Instantly Cured. Yes, this book contains romance and mental health, but it's well balanced and doesn't romanticise mental illness at all, I'm happy to say. In fact, this is one of the best and most hopeful representations of mental illness I've seen in YA. It's truly special and beautifully done. That cover really does look fine! I'm always curious as to how an author will portray mental illness in a book - because so much of these kind of books have been written and the subject was not properly portrayed. I'm really curious with this one though - I've heard many good things about Emery Lord! What template do you use on your blog?